Above: That's a columbia, on the right,top to bottom thats a coburg, a comisana, the columbia with those beautiful neck rolls, shropshire and gotsburg. All contribute to the making some of the most beautiful yarns in the world, and have left their unique imprint on our favorite fiber craft. There's more about each breed on the back of every card. In honor of Sheep & Wool, whjch happens every year in our neck of the woods, we are having a Sheep Show! Not the real thing - they'll be at the Fairgrounds. 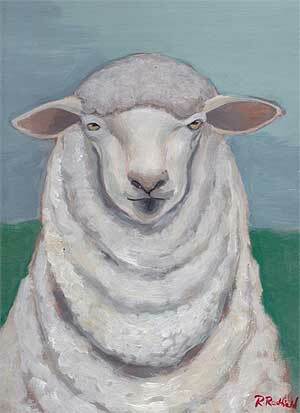 But thru a show of paintings by local artist Rochelle Redfield, and with our fabulous BAAA cards. The show is going up over the next week, and starts with the critters at left, and we'll be adding LLama, Goat and Bunny. Rochelle takes a look at our favorite animals in a whole new way. This first set showcases five breeds - Coburg, Comisana, Columbia, Shropshire and Gotland. 2 of each breed are in every box, signed by the artist. On the back of each card is information on each breed. Grab a box of these cards and let everyone know about the fabulous animals that make your favorite craft possible. We fell in love with these paintings, and we wanted to share them with everyone - you'll love them too! The paintings are for sale as well - just email us for pricing if you are interested. 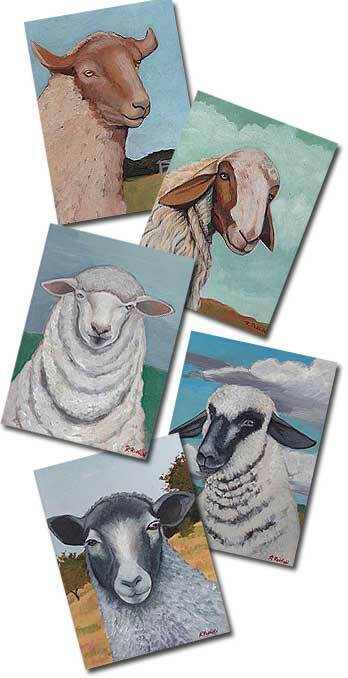 $22.50 set of 10 reproductions of original paintings (2 of each breed) by Rochelle Redfield on recylced matte greeting cards - the back features information on each breed. Set of 10 Cards with matching envelopes. Enter text below, we'll create and enclose it with your gift.